There are several reasons why a guitar may appear to have tuning problems. Most people are quick to assume that the machine heads (tuners) are the reason for a frequently out-of-tune guitar, but in fact they are rarely the cause. Here are a few causes, how to spot them and very briefly what to do about them. I’ve listed these more or less in order of cheapest/easiest to most expensive/difficult to repair. Some of these have been covered in more detail in previous posts, and others will be covered in future posts. I’ve left out tremolo problems because I’d like to do a separate article about those. Strings are still "settling in"
When you first put new strings on a guitar, they are very springy and take a while to settle in, Settling in really means stretching. You can speed up this process by manually stretching the strings after you put them on your guitar. Simply put your finger under each string (about halfway up the neck is fine) and pull the string away from the guitar by a few inches. Don't pull so hard that you're in danger of snapping the string, though. You'll probably have to re-tune the string after doing this, but this only shows that you have most likely successfully stretched it. Guitar intonation refers to how well the neck length and the fret spacing match up. That might sound very technical, but the only thing a normal user probably needs to worry about is the forward/backward position of the saddles. If you suspect your tuning problems are caused by an intonation issue, try the following. Tune the open strings properly and then check the same strings at the 12th position. If they are in tune (exactly one octave higher), then the intonation is probably OK. If not, then this can be fixed by adjusting each saddle until open and 12th positions of each string match up (exactly one octave apart). Note: If the 12th fret note is too high, move the saddle back. If it’s too low, then move the saddle forward. If the strings are too high off the fretboard, either because of a bowed neck or saddles that are set too high, then in certain positions, especially higher up the fretboard, the strings have to be pushed down so far to meet the frets, that you end up stretching them. This will, unsurprisingly, knock them out of tune. In some ways, the tuning problems are the same as when the intonation is wrong, in that the higher up the fretboard you go, the more the strings will be out of tune. The difference here is that you will know the strings are too high because you have to exert so much effort pushing them down to the frets. If the strings are too low, you’ll know pretty quickly, as the strings will rattle against the frets. The easy fix for this is to set the action a bit higher until the buzzing stops. If you find that you need to set the strings very high to avoid this, then you may need to look at the neck bow. You might also want to think about other reasons for rattling noises, such as the problem emanating from the nut or the saddles. A nut that is too high gives you similar problems to when you have guitar action that is too high, except that the out-of-tuneness is most noticeable in the lower frets, as the string is really having to be pushed down a lot more in those positions. If the string height over the 1st fret seems far too high, then maybe consider lowering the nut, or one of the slots if a particular string is affected. A nut that is too low is going to give you similar rattling problems to when your guitar’s action is too low, except that it ONLY affects the open string. If you are getting a rattling sound and suspect the nut may be the problem, put a capo on the first fret and see if the problem disappears. If it does, then the most likely problem is the nut. In fact, this is a great way to diagnose ANY nut problems. Sometimes the guitar nut pinches the strings (i.e. 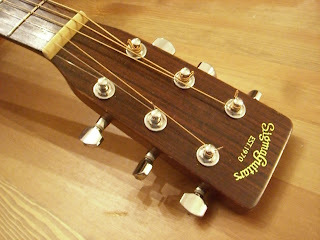 grips them too hard) because the nut slots are filed too thin for the strings you are using. You will know if this is the case because when you turn the machine head, the string will make a pinging sound as it jumps up or down in pitch while being tuned. This jumping makes tuning difficult because you cannot really fine tune (not to mention the additional problems you will encounter if using a tremolo – but that’s for another day). The solution here is to widen the string slot on the nut (be careful just to widen it and not to lower it). The nut slots should be angled slightly so that the highest point in the slot is just where it meets the fretboard. You could probably just about get away with a perfectly horizontal slot, but I really wouldn’t recommend it. A slot which has its highest point nearer to the head of the guitar, or anywhere else between the front and the back is absolutely unacceptable, as this is, in effect, moving the position of the “zero” fret. Think of it like having a bridge saddle too far back or forwards, but at the other end of the guitar. Machine heads fail for a number of reasons. Sometimes they’re just not very precisely made, sometimes things wear out, or sometimes things break. However, machine heads are not the cause of tuning problems as often as you might think. If you are pretty sure one of your machine heads is being problematic, and you want to test it before paying for a new one, try swapping its position with another machine head on your guitar. Now pay attention to where the problem is. Did it stay with the string or with the machine head? If it stayed with the machine head, then, OK, feel free to buy a new one. I’ve left this one to the end because, in my opinion, it’s the one you’re most likely to have to pay a guitar tech to fix. An uneven fret is a fret that sits too high or too low on your fretboard. If it’s too high then when you play one fret closer to the head of the guitar, the string will actually hit this fret instead. If it is too low, then when you play this fret, it will hit against the next fret towards the bridge of the guitar. A higher fret is easier to fix, but for both I would recommend just taking the guitar to a professional. There is one workaround you might consider, though. If the uneven fret is not VERY high or low, increasing the action of the guitar a little may make it not noticeable enough to be a problem. Well, I hope the above information has been of some use to you. I’ve tried not to go into too much detail because it’s a lot to take in already, and, frankly, you could write a book about this stuff (as some have). As always, if you have any questions or anything else to say, please feel free to leave a comment below. How do I move the saddle back on a guitar already glued together? you are right about this tuning problems, we can write a book about this. great articles you have here. thanks.